pics! West Aurora March 23! 3D artwork at West Aurora High School on the eve of March 23, 2019 for the 40th Anniversary Huntley Brown Concert featuring the Covenant Choir from Covenant Christian School. Come experience the mind bending illusion based artwork of the Chicago Chalk Champ, Shaun Hays, this June 22 & 23. Shaun will be demonstrating his extemporaneous, freehand mastery of the 3D anamorphic drawings that have made him famous! Photos interacting with the illusion are a must for your summer to do list! The Naperville Woman’s Club host the Naperville Art Fair each year inside Naper Settlement with 130+ artist on display. This year, will mark the 60th year of this fest!! Stroll through the vendors, see demonstrations and enjoy the beautiful historic landscapes… all while attending the longest running juried art show in Illinois! Now Booking Events – 2018! 2017 was a superior year and 2018 promises to our best yet! Chicago Chalk Champ, Shaun Hays, is looking to add 52 clients to the docket in 2018 and you can be one of them! Past clients include Starbucks, Chipotle, Redbull, Lollapolooza, Macy’s, Shedd Aquarium, Adler Planetarium, Navy Pier, and hundreds more! With 52 spaces this year and only a few of those spaces being actively pursued by Gold/Platinum Clients, we have a huge opportunity to expand into your market no matter your budget restrictions. Don’t assume anything! Give us a call today with your idea/event info – leave the creativity up to us! We also have several established, champion artists to book in lieu of Shaun if he is unavailable, some with the specific skills you need! Champ Demonstrates 3D Chalk Art at Events for CPS and Illinois schools. This September I had the privilege of going into several inner city neighborhoods to add an artistic element to the educational process right here in Chicago. I spoke at several schools and drew 3D pieces for most of them as well. The children, staff, volunteers and parents were fabulous and friendly making the events during and after school memorable and hopefully life changing in a truly positive way!! A child poses on one of Shaun Hays’ 3D Chalk Art Creations in Humbolt Park during an after school celebration of the Arts. Ask about our Indoor mess free options! Schools, after school programs and youth development organizations are encouraged to inquire. 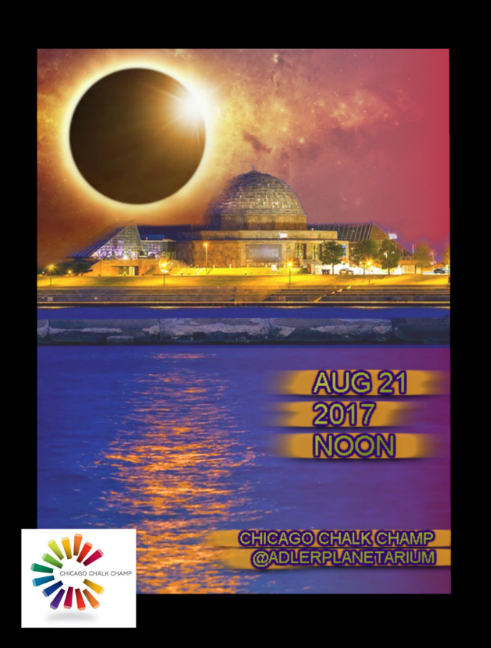 I usually don’t make announcement before an event finalizes the details, but I think you should be notified about this one asap: I am working out details with Adler Planetarium on Chicago’s Lakefront for some amazing Chalk Art Masterpieces! MONDAY, August 21st will be a very rare Solar Eclipse for us in the U.S. Midwest. We are celebrating with a huge party – so skip work and come on out to enjoy some great music and entertainment that includes the Chicago Chalk Champ, Shaun Hays! I’ll be working on live art throughout the day but Noon will be a great time to get pics of the art. 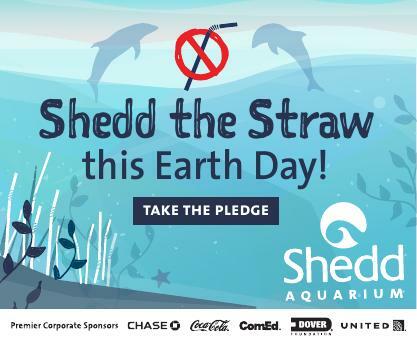 Navy Pier and Shedd Aquarium Join Forces with Chicago Chalk Champ, Shaun Hays, to celebrate World Oceans Day (June 8th) with a pop-up style Chalk Art Fest in Polk Brothers Park. Patrons tried their hand at sidewalk chalk for free and added their art to the chalk board kiosk when they committed to #sheddthestraw in 2017! Thank you to all who came out to help us chalk up the Polk Brothers Park with sea life and love! Kathleen Roling joined #chicagochalkchamp, to render some magnificent animals affected by the plastics in our oceans. I had done this twice already this year: once here at Polk Brothers PArk and a second time between the Shedd Aquarium and the Field Museum on Earth Day. Chicago Chalk Champ, Shaun Hays will be chalking amazing sea life pictures for Shedd Aquarium’s Earth Day Promotions: April 8, 2017 at Navy Pier and April 22nd between Field Museum and Shedd Aquarium. Drawing Fish, sea life, shells, etc. and my dream to make a connection. I collect shells and rocks…always have. 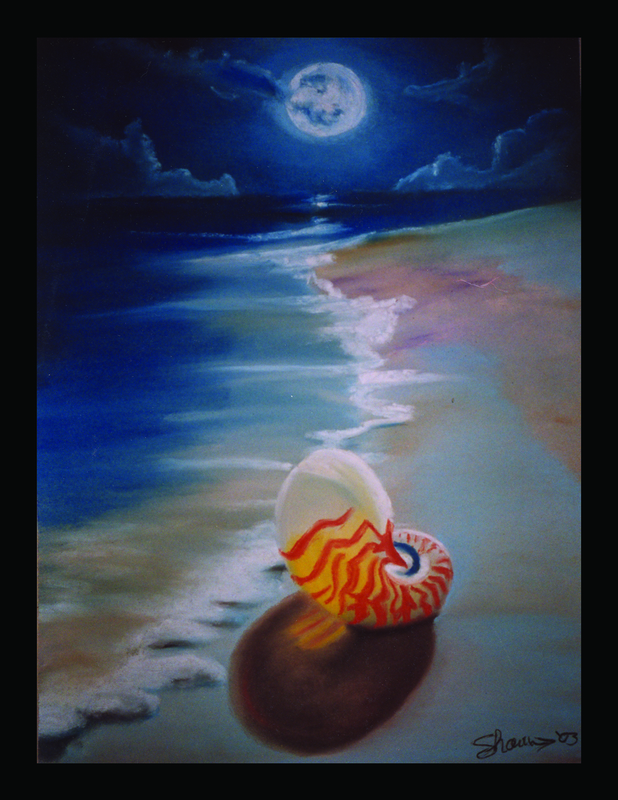 My favorite is the Nautilus Shell which I have painted and drawn many times in my public and commissioned works. Shaun Hays, Chicago Chalk Champ – “Peace in the Midst of Chaos” this was an early practice piece that was given to a good friend. The original concept came from seeing another artists Painting in my travels, but, I have no idea where I saw it, so i cannot give credit. I think I rendered it close to the original. I’ve always enjoyed being physically by the water, and, close to earth…it just feels right to me. My fantasy life would be to live as a stingray. To live, either gliding through the water like I’m flying, or to cover myself in the sand and silt for a nice meditative nap (and of course wait for my next meal haha). Beyond that, I have always enjoyed looking at underwater sea life and its beauty, so in 2009 when i set out to become the premier chalk artist on the shore of Chicago’s gorgeous Lakefront, there was one place I intended to ultimately work with… you guessed it: the John G. Shedd Aquarium. And believe you me: it’s been quite a journey. At first, I did the obvious – email and call to introduce myself and hopefully catch a lucky break. I guess I had hoped the idea of chalk art at Shedd would be enough for someone to just say: “WOW, Shaun! No one has ever thought of that before!! You’re hired!” hahaha well, obviously everyone thinks of these ideas and (surprise!) I’m not as industrious, and unique, as I thought. Next: I attended Shedd events and at times just wandered in and handed a card to someone, but, then, I got a bit more determined and began to ask questions about who books events at Shedd and what kind of events are held there. In 2013, after some trial and error, I had a face to face with a wonderful lady who promised to keep my card and consider me for future events. The fact is, I wasn’t too confident leaving there that day, that she would. I kept hope, but i know even if intentions are good, it sometimes just gets lost in the busyness. After all, everyone wants their idea to be the one that makes the cut… and in a city this big, it’s tough to get your shot. Meanwhile I’ve had several pieces featured at the Museum Of Science and Industry, Navy Pier, John Hancock Place, North Beach, Parades and Races, Lollapalooza (unofficially – long story) up and down Michigan Ave and State Street, Millennium and Grant Park, Major Hotels etc… and become somewhat of a regular at McCormick Place Events and Expos. That’s not to mention the hundreds and hundreds of events all over Chicagoland, the US and International events. But, Alas, no invitation to my beloved Shedd Aquarium. I began to feel like the creepy guy with a secret crush and too many awkward attempts at conversation. I don’t know if that meeting and my card was the catalyst or not, but something has finally broken the ice. In early 2017, the day came that John G. Shedd was actually looking for a chalk artist! YAYA! I wasn’t going to let this one slip by. I told them in no uncertain terms “I want this job”. I repeated that in my emails (which there have been too many to count). I hope to make an announcement very soon regarding this. Until then, enjoy this picture(s) of (a) Jellyfish I took while at Shedd a couple years back, which I will soon render in chalk for one randomly selected, super lucky fan who likes and comments on any page this is shared on. Who knows… I may choose more than one??? Lets make 2017 amazing!